RD concepts started with an idea in 2005 while one of the partners was attending graduate school for object oriented programming. From the first exercise program as part of his master's project, the company idea seed was planted. After graduate school, the partner was approached by a conservationist to work on a forestry system. 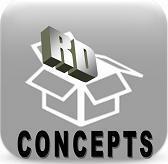 During the development, RD Concepts was incorporated. RD Concepts is a software development company with a focus on being a personal information technology department for our clients. Whether a need is for a Carboplatin dose calculator for a clinician, a grain moisture calculator for farmers, or a trucker’s hauling calculator to determine his pricing, we strive to meet the needs of our clients, so they can use technology to streamline their perspective professions. From our initial forays into Windows programming, we have also worked on web, mobile and Chrome development projects to assist our customers. In the future, our plans are to launch into more environments to meet the demands of the users. The goal of the partners is to work together to build RD Concepts into a company to help other people. We want to build software and provide services to assist people. Our ultimate goal is to make people's lives easier.